The new Fame DP-4000 is a price wonder among home pianos! 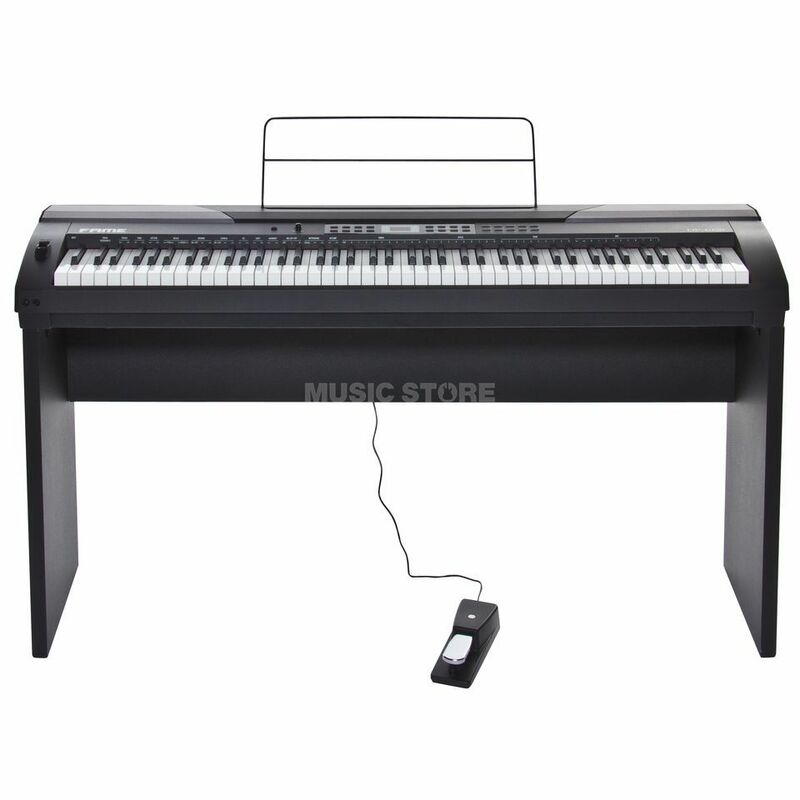 The piano is equipped with 88 hammer mechanic keys, offering great playability and which impress with a great pressure point and its great repetitive behavior. The keyboard is exceptionally well balanced and practically feels and plays like a traditional piano. There are 20 different tones with 128-voice polyphony onboard, so that you are not always plying the same piano sounds all the time. The sounds are clear and brilliant and surpass the sound quality of other digital pianos in this price class. Next to Grand piano and E-Piano sounds, there are also additional realistic sounds such as Organs, acoustic guitars, bass and strings available. The dual function makes it possible, for example, to add strings to the piano, resulting in a fantastic effect. This is an obvious advantage compared to traditional pianos. Here you are offered a ton for your money! The high performance integrated speaker system consists of 2 x 20W @ 8 ohm is more than enough for normal play in your bedroom. Due to the fact that the speakers are built into the top, it can be removed and transported to the next party. An optional stand that can be folded together makes transport much easier and comfortable. The DP-4000 possesses two headphone outs. This allows you to not only play solo, without bothering others, but also as a duet. An AUX Out has been made available to connect the keyboard to larger PA systems. An external audio source can be connected via the AUX In socket. MIDI data can be transmitted to a computer or other MIDI equipment via USB and standard MIDI Out. There are hardly any other e-pianos in this price class that offer more than the DP-4000! Available in matte white, matte black and high-gloss black. Included is a beautiful wooden stand, power adapter as well as a double pedal. The DP-4000 also offers an accompaniment function with 50 styles. Whoever wants to play hits and evergreens with their left hand but is not yet a professional, can turn on the styles! There are the right rhythm and accompanying chords for all musical styles. A perfect band will stay by your side, even if you only play one chord with your left hand. The 50 styles range from Romantic Beat and Pop over standards such as Polka, Marching and Boogie all the way to Jazz, Ballads and Piano bar styles. An extensive selection of Latin American styles include Latin, Tango, Lambada and many more. In addition, there are also 60 complete songs available to play-a-long.